Exodus 25:8-9 “Let them construct a sanctuary for Me, that I may dwell among them. 9“According to all that I am going to show you, as the pattern of the tabernacle and the pattern of all its furniture, just so you shall construct it." We began yesterday with an introduction to the Old Testament Tabernacle. 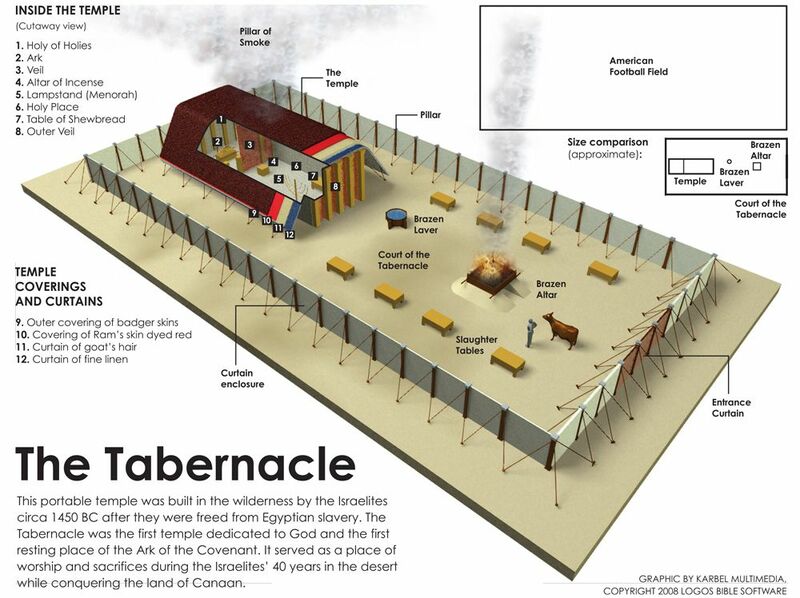 We defined what the Tabernacle was, why it is important to study and some of the major truths God intended to convey to it. That sanctuary, or dwelling place, is what the Bible calls the tabernacle (from the Latin term tabernaculum meaning "dwelling place"). From Exodus 25-31 we see a detailed description of all the various furnishings, the rituals, the design and the priesthood. When we turn to chapters in the New Testament like Hebrews 8-9, we discover that this worship center in the Old Testament pictures for us the Act and Accomplishment of Jesus Christ in the Old Testament. "For there was a tabernacle prepared, the outer one, in which were the lampstand and the table and the sacred bread; this is called the holy place. 3 Behind the second veil there was a tabernacle which is called the Holy of Holies, 4 having a golden altar of incense and the ark of the covenant covered on all sides with gold, in which was a golden jar holding the manna, and Aaron’s rod which budded, and the tables of the covenant; 5 and above it were the cherubim of glory overshadowing the mercy seat; but of these things we cannot now speak in detail. 6 Now when these things have been so prepared, the priests are continually entering the outer tabernacle performing the divine worship, 7 but into the second, only the high priest enters once a year, not without taking blood, which he offers for himself and for the sins of the people committed in ignorance. 8 The Holy Spirit is signifying this, that the way into the holy place has not yet been disclosed while the outer tabernacle is still standing, 9 which is a symbol for the present time. Accordingly both gifts and sacrifices are offered which cannot make the worshiper perfect in conscience, 10 since they relate only to food and drink and various washings, regulations for the body imposed until a time of reformation." As the reader can tell, Hebrews 9 takes the Old Testament Tabernacle and uses it to illustrate and set the stage for the exposition of all that Jesus achieved on the cross. For today's post, we want to understand how to connect the Tabernacle to New Testament truth. Below we will work through a series of questions and answers in our understanding of how the Tabernacle and New Testament Christianity are presented in the Old and New Testaments for our application. 1. How does one go about studying and relating the Tabernacle to Christ/the Church/the Christian? 2. The ceremonies of the tabernacle are a "type" or picture of Christ’s work. When you turn to Exodus 31, you find Moses laying out the summary of God's prescribed way of salvation and worship that He reveals in Exodus 25-30. 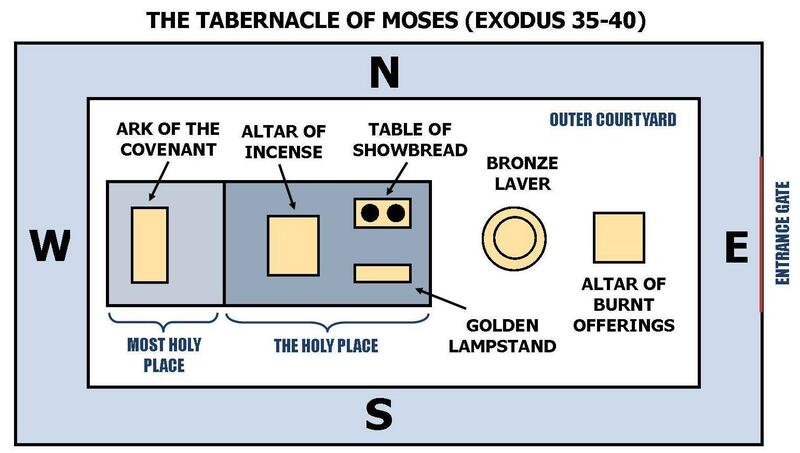 The various furnishings of the tabernacle work together to communicate the One Way through which God would approach the people, the the One Way by which they were to approach Him. Just as John 14:6 presents Jesus stating Himself as the only way to God; the Old Testament Tabernacle pictures for us and points us to Jesus Christ. How? Consider what one would had witnessed when watching the daily rituals associated with the Tabernacle system. What would you had done as a man or a woman living in the camp of Israel as you went to the center of the camp to "come to church" so to speak? As you approached the Tabernacle, you would had brought with you a sacrificial animal, since apart from the shedding of blood there is no forgiveness of sins. The tabernacle itself was surrounded by a courtyard composed of a white linen "fence" encircling all around. A multi-colored "gate", some 30 feet wide, was the only means of entry. According to Exodus 27:16, this "gate" was woven out of differing colors of linen, each corresponding to some characteristic of God Himself. A Priest would meet you at the entry way to ensure that what you brought was fit to offer. Once deemed acceptable (for the animal had to be without blemish), you would enter into the main courtyard. The priest would then hand you a Bronze knife, at which point you would slit the lamb's throat in the prescribed fashion. The Priest would then catch the animal's blood in a sacred vessel, and then take the blood to be poured out at the base of the altar in the courtyard. After taking the animal, the priest would perform the ritualistic preparations and offer the lamb in your place. The smoke of the sacrifice would ascend up into the Glory Cloud of God over the tabernacle. If the smoke went straight up, that meant God had accepted the sacrifice and your sins were "covered" and His wrath against you was "satisfied". All of the above descriptions point to what would be the final work of redemption accomplished by the Lord Jesus Christ. 3. 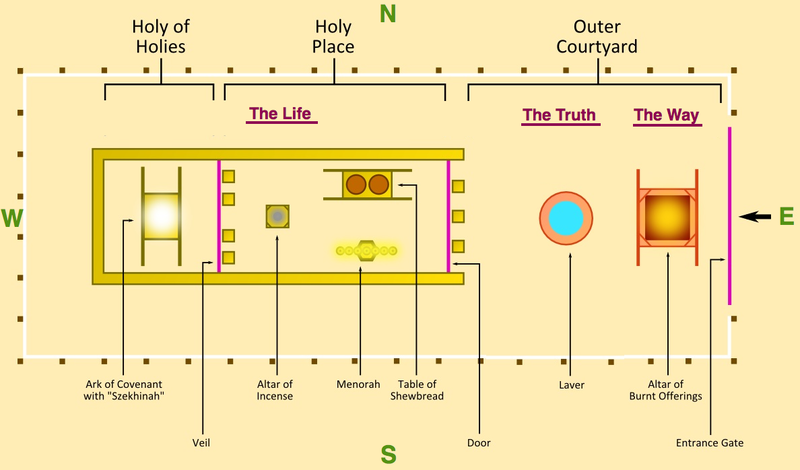 The floor-plan of the Tabernacle pictures for us how Jesus is the "way", "the truth" and "the life". a. Jesus is the way (outer-court) that features His redemptive work (altar) and which, upon reception in saving faith, is followed up by believer’s baptism (laver). b. He’s the truth (holy place) that we live by, lit by the lampstand of His Word, nourished by His fellowship and to whom we pray. c. He is the life (holy of holies), wherein we enjoy sweet communion with the Spirit sent in His name to our inward man. John 14:6; Hebrews 10:19-25.